Since 2016, Freightliner has been providing specialised haulage services for the steel industry. In addition to standard metallurgical products, such as steel profiles and semi-finished products, we also transport rails with a length of up to 360 m. We have signed a contract for the haulage of rails manufactured by Arcelor Mittal Poland to Germany. 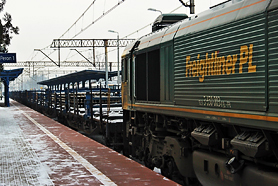 We also provide haulage services using trans-boundary locomotives, thanks to which have minimised the length of time needed to stop at the western border. We also participate in the modernisation of railway lines in Poland, providing long rails for the indicated sections. Our personnel possess the appropriate competences that allow for efficient and effective order execution. Anytime during the freight haulage process, our customers are informed in detail about the status of the freight under haulage.